I have reviewed several electronic readers to determine whether they are useful for people with low vision (see my reviews of the Kindle 2; Sony Reader; and the iPad). 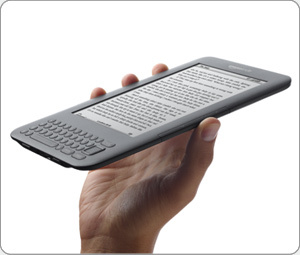 Amazon have recently released a new version of the Kindle that is known as Kindle 3. A noticable feature about the new Kindle is how small and light it is. Before my Kindle arrived I saw an older man in the waiting area outside our low vision clinic reading one with a Keeler segment (a small high powered spectacle lens, which requires text to be held a couple of inches from the face). He remarked how easy it was to hold the Kindle at 5cm (about two inches) for a prolonged period of time, unlike a heavier book or larger newspaper. Amazon claims that the screen has higher contrast as well. I was skeptical about this claim but measured the Michelson contrast (in a normal office environment) to be 73% (compared to 60% for the earlier Kindle). Whilst still nowhere near as high as the 99% which the iPad can achieve, this is still an improvement on the previous version. Perhaps more significantly the text can be enlarged further as well: to 5M (5 times the size of newsprint; equivalent to 1.3logMAR or N40). It also incorporates text-to-speech. In my limited experience with the device most new books do not have text-to-speech enabled (a decision which is made by the publisher), but classic books which are out of copyright all seem to have this feature enabled. 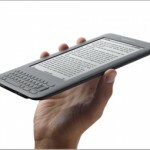 So, is the Kindle the best electronic book for people with low vision? I would still say the iPad is better for people with reduced contrast sensitivity or severely reduced visual acuity, but this Kindle is certainly better than its predecessor. Many people will prefer the reduced screen reflection and lower glare of the Kindle’s electronic ink display, and the fact that it is so much lighter than the iPad will be helpful for people that use close working distances to read. Perhaps most significantly, it’s only a quarter of the cost! The Kindle 3 costs $139 U.S. dollars, compared to $499 for the iPad. Ideally people with low vision considering electronic books should try and borrow each of these devices and should read, at home, for an extended period of time with each one. I imagine both the Kindle and the iPad will be useful to many people with visual impairments. This blog post originally appeared on Low Vision News. Michael Crossland is a U.K.-based academic optometrist with an interest in low vision rehab and research. any idea if it will be released before christmas? Where can I buy a KINDLE with font of 14 or larger ?? My wife has macular degeneration in both eyes ( one worse than the other ). She has a kindle and loves it for reading because of the large print and the contrast. Using the keyboard is another story. She wanted it so she could continue with her Bible study. Navigating the Bible on that keyboard is nearly impossible for her. She can’t see the home, back , and menu keys. Neither can she see the bars around the enter key. Those keys need to be larger and highlighted in a different color. Also the finger, which is the cursor, on the screen needs to be larger and a different color or anything that would help recognition. I have an I Pad and it’s easier to navigate because of the touch screen. However the screen has too much glare. Someone needs to incorporate the best features from both devices. I am looking for something for a senior citizen friend who can no longer read small print due to macular degeneration as well. Are there any new devices out there for older folks who have this eye problem, and cannot keep up witht the high-tech surfing to make them work??? I agree the Kindles are great for reading books, but my husband still needs help to purchase new books as the system font sizes are too small for him. Also the dictionary is in a typeface too small for him to read, so he can’t look up words.